Want to update your fitness gear without breaking the bank? The solution might be as close as your local drugstore. Really! Drugstores carry just about everything nowadays, including a number of items you'll want to add to your current collection. Want to update your fitness gear without breaking the bank? The solution might be as close as your local drugstore. Really! Drugstores carry just about everything nowadays, including a number of items you'll want to add to your current collection. With that said, here are five affordable fitness finds to look for the next time you shop there! Drugstores, such as Walgreens and CVS, often sell cheap t-shirts and tank tops for approximately $5-8 each, a great price considering you're just going to get them stinky and sweaty during your workouts. These tops are typically light-weight and come in a variety of colors, so you can purchase a bunch and wear them alone or layered over a sports bra. 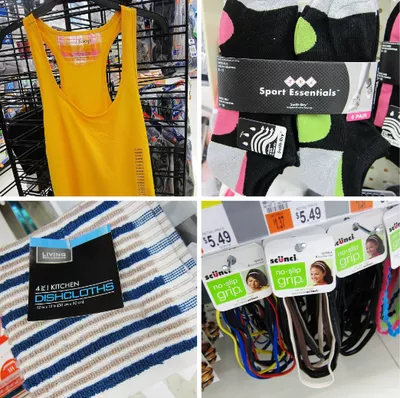 Like the t-shirts and tank tops mentioned above, a number of drugstores sell athletic socks in a variety of styles-- from ankle to knee length-- for affordable prices. My local drugstore offers a package of six pairs for just $6! Now that's a price that can't be beat! I can't stand when my hair falls in my face when I exercise, so I always wear a headband when i workout. Most drugstores sell a variety of headband styles for cheap. Most come in packages of three or more, so you'll get a bunch of fun colors and designs to coordinate with your workout attire. Same goes for bandannas. They're affordable (my local drugstore sells them 2 for $1) and they come in all sorts of patterns. Do you ever deal with chaffing during your workouts? Instead of buying expensive body glide, a jar of Vaseline is a much more affordable option and works just as well. Before you exercise, spread a thin layer of Vaseline on your trouble areas to prevent uncomfortable chaffing and blistering. I sweat a lot when I exercise, so I typically bring a small hand towel with me to mop up my perspiration. The majority of these towels come from my local drugstore where I buy 3-packs of kitchen dish towels on the cheap. Dish towels as sweat towels? You bet! Between sweat and dirt, these hand towels won't last long, so I don't like to spend a lot of money on them.